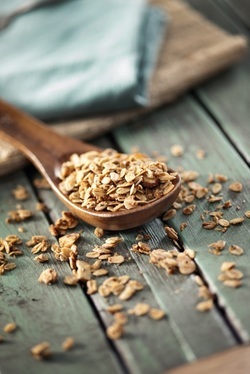 “Homemade granola is always great to have on hand for a quick go-to breakfast or even as a late-night snack that is low in sodium and sweet enough to satisfy your cravings. Most store-bought granolas tend to be too hard and crunchy and have a packaged taste and less flavor,” the chef explains. Preheat oven to 350 degrees. In large mixing bowl, combine dry ingredients. Add oil and almond milk and combine. Line a rimmed baking sheet with parchment paper and spread mixture evenly onto pan. Bake for 20 minutes. Let cool before storing in an airtight container. Serve with plain yogurt and top with fresh pomegranate seeds if desired.